I had been reporting on gymnastics events for a variety of magazines since 1975, and was keen to visit the Soviet Union for a major tournament. When I heard the Americans would be boycottting the 1980 Moscow Olympics, I thought I might stand a good chance, so I wrote a request for a press pass, got a colleague to translate it into Russian, posted it off and waited. Some weeks later I got home to find the post office had left me a docket telling me that they had a registered letter from Moscow awaiting collection. "It's my tickets!" I thought. I charged down full of excitement and was handed a suspiciously thin envelope, which proved to contain a single rather grubbily-photocopied sheet of paper informing me that I had applied to the wrong place. Not only must this item have cost a fortune to send by registered post all the way from Moscow; it probably got me on some M15 list of suspects. Things weren't much better when later that year I applied to attend a tournament in East Berlin. In this case I did receive a very friendly invitation; the only drawback being that my the time it reached me, the event had already finished. A check of the dates on the letterhead and the postmark suggested it had sat on someone's desk for a whole month before being posted, and the fact that it was addressed to "Stoke-on-Trent, USA probably didn't help. There was less visible co-operation when I applied to the organisers of the World Student Games in Bucharest: in fact I received no reply at all; but a German friend who attended the tournament informed me that the Roamanians had actually set up facilities for me in the press centre, and I should have gone. I protested that they hadn't bothered to let me know. "Oh, the Romanians never tell you anything!" he replied. "You just have to turn up!" However, in 1981 I did receive tickets for the World Gymnastics Championships in Moscow. The next problem was getting a visa. When there was still no sign of mine a week before the start, I rang up the travel agent, who told me that patience was needed and I shouldn't start to panic until 24 hours before the flight: such delays were standard for Soviet bureaucracy. "And I tell you, it's getting worse!" he exclaimed, "And Reagan's afraid of these people invading us!" I had visions of a mechanised offensive into Central Europe having to be postponed for lack of visas. But his advice proved right, and my documents duly arrived a whole three days before departure. I was the only person in our party to be searched at customs on the way in. The official read through my address book and notebook, leafed through my wallet, and carefull scrutinised the crushed Remembrance Day poppies, old tickets and screwed-up sweet papers that he found in my coat pockets and the bottom of my bag. having failed to find anything interesting, he then asked, "Vy have you come?" "I sink you are too late; it has finished". "No it hasn't: it's going on till Sunday!" Since I had avoided this little trap, he lasped into apathy and let me through. "Your name is Maurice Kerr-niggt?" "No, my name is Maurice Knight!" "Your name is Maurice Kerr-niggt". This time it was a statement, not a question. "Yes, I know it's spelt like that, bit actually it's pronounced Knight"
"Your name is Maurice Kerr-niggt". Voice from the back of the queue, "For heaven's sake, Maurice, tell her you're called Kerr-niggt or we'll be here all day!" "Oh all right then; my name is Maurice Kerr-niggt"
"Go through!" Honour was satisfied: the foreigner had done as he was told. When we boarded the bus to our hotel, we were told that the first gymnastics we wouldbe attending would be the women's finals the next day. Maurice and i immediately protested: what about the men's tournament that evening? We had been promised entry to all events! Elena, our guide, was sympathetic but firm: she was very sorry, but it was impossible; no tickets were left. We were thus not in a very good mood when we reached the hotel, where we found another British party about to leave for the stadium. Yes, they also had been told there were no tickets, but when they complained sufficiently some had materialised. So Maurice and I approached their guide and explained the position. Within a couple of minutes she had managed to locate two spare tickets, so Maurice and I abandoned our luggage at reception and went off to the stadium, and the competition we watched was so exciting we wouldn't have missed it for anything: Korolyev just sneaked ahead of Bogdan Makuts on the very last piece of apparatus. The next day a very tiny and very young girl called Bicherova took the women's title ahead of my favourite gymnast, Maria Filatova. But I'll describe the gymnastics some other time. The tournament was in many ways not well organised. The Russians were incapable of producing a printed programme for the spectators, who thus had nothing to tell them what was happening next, or who was wearing what number, let alone having nowhere to keep the scores, so at the close few had any notion of the result until the parade of the medal-winners. A few privileged officials were given printed scoresheets at the close, which I had to cadge and then spend hours copying scores out by hand. Even this was not as easy as it sounds, since the names had been translated into Cyrillic script and then back again, by someone whose command of English was distinctly shaky, with the surnames first. The resutlts were often comic. Who in the British team were Prais Heili, Iang Liza, Vezerstoun Cheril and Deivis Dzheffri? (Hayley Price, Lisa Young, Cheryl Weatherstone and Jeffrey Davis). Other nationalities were just as bad, and for the Chinese, just to be different, the surnames had been put last. Even the entry tickets were substandard: whole blocks were printed on single sheet of cheap paper without perforations, and then clumsily and inaccurately torn off one by one. Moscow in Novemberis cold. during the day the temperature may creep up to above zero, and the sunlight glitters on the gilded domes of the Kremlin cathedrals, but there is a bitter chill in the air when the wind blows and everyone has to wrap up well. The ground is iron-hard, there are flurries of snow, and ice begins to float on the river. It was at this precise time, forty years before our visit, that Hitler's armies ground to a halt on the Sparrow Hills within sight of the city and suffered astronomical casualties as they tried to dig in for winter. Our hotel was a modern one, opposite the Park of Economic Achievement, looking out on a monument to Soviet astronuats that consisted of a great curved rocket-trail looking like a bronze ski-slope. The hotel food wasn't bad, but when two British businessmen at our table asked for champagne they were told there wasn't any. Since several bottles were promonent on other tables this wasn't very convincing, and it took considerable badgering before someone looking like a manager appeared and contrived to locate a couple of bottles in quick order. (It was at this same hotel three years later that I had a surreal experience involving the crockery, which was rather crude and often chipped. Living as I did in Stoke-on-Trent, the world centre of china-ware, I performed the ritual of the "upside-down club": turning a plate over to find where it was made. This proved to be somewhere in East Germany, and the trade name, amazingly, was "Colditz"! In next to no time, everyone in the room was turning over their plates too and exclaiming, "Ooh, so it is!" The staff, of course, had no idea what the joke was, and when we came down for our next meal we found our party had been screened off from the everybody else. "People complained about the noise", we were told. Between he hotel and the stadium was a large shoe-shop. Every time we drove past on our coach, even late in the evening, there was always a long queue outside, spilling down the pavement. Eventually one of our party asked Elena the guide, "Why are all those people always queuing outside that shop?" Without batting an eyelid she replied, "It is because they have plenty of time". This was such a splendid answer that none of us could think of any riposte. And in a sense she was speaking the truth, because with goods coming into the shops so irregularly, any Muscovite who saw a queue would be advised to join it, and find out what was on sale later. (See appendix: Russian jokes) There was also a functioning Orthodox Christian church close to the hotel, with attractive bright blue onion-domes flecked with gold stars. I looked in once, to see old ladies bowing and scraping and crossing themselves before the icons: they seemed to constitute the entire congregation. The priest looked exactly like Rasputin in films. We were taken round the usual tourist sites each morning before going to the stadium. I didn't bother to visit Lenin in his tomb (I had seen him on a previous visit: we thought he was a waxwork), but I did go to St Basil's Cathedral on Red Square. It was much brighter externally than I remembered: perhaps it had been repainted for the 1980 Olympics. All eight of the miniature domes surrounding the central tower were different, and beneath each was a separate chapel, some being scarcely bigger than chapels. Old ladies sat inside them, swathed in blankets against the cold and lookingup from their knitting to shout "Don't touch the icons!" at the tourists. There was a guided tour of the Kremlin, with its splendid cathedrals, plus the Tsar's bell (so big that it could never be hung) and the Tsar's cannon (so big that it could never be fired - something very Russian about these!). In the Treasury was a fine collection of Sevres porcelain. I told Elena that, coming as I did from Stoke, I was interested in ceramics. She knew about Wedgwood, and said how much she liked the blue-and-white jasper ware. I told her it was still being made. "Can anyone buy it?" she asked. I felt like telling her that it wasn't reserved for high officials of the ruling party, if that was what she meant. I asked if she would like me to send her a small piece, but she was most insistent that I shouldn't. Elena was also puzzled by the fact that I owned my own house. "How can you have your own house when you're not married?" she asked. She still had to share a flat withher parents, despite being a university graduate. It goes without saying that we were approached on the street by locals wanting to change money or buy our clothes. A group of us met a bunch of young Muscovites headed by a youth with blond-dyed hair, a black leather jacket and an acid burn down his cheek. "You guys got any shoes you wanna sell?" he asked, with an accent suggesting he had learnt his English from old James Cagney movies. One of the American coaches described to me how he was engaged in selling his jeans to a taxi-driver, the way one does, and was haggling about the price, when the taxi-driver had a bright idea. "If you accept my price", he said, "I will give you a nice Polish girl!" "Look, mate", replied the American, by his own account, "I don't want to go home with something I can't wash off!" The taxi driver deduced from this that here was a tough bargainer. "If you don't like that", he riposted, "then I will give you a nice Russian girl!" This would appear to tell us something about he relative status of the two races. "And do you know how much we were arguing about?" the American told me, "Two bucks! He was going to give me a girl for two lousy bucks!" I never had an experience to match this, but I remembered how on a school visit some years earlier, one of the boys wanted to go swimming. There was in those days a vast open-air swimming pool in the middle of Moscow (it isn't there any more: see footnote), and the man in charge of the party taught him the Russian for "swimming pool" and told him to take a taxi. What happened was that the boy instantly forgot the Russian for "swimming pool", so instead waved his towel and bathing trunks at the taxi driver; who promptly made him an offer for them; and so instead of swimming he went back to the hotel and spent his gains on vodka. In fact there wasn't much point in selling clothes,or in changing money on the black market, since there were special shops called "berioskas" which only accepted foreign currency, and in any case, when we returned to the airport we had to account for all the roubles in our possession and then change them back at iniquitous rates. An hour into the flight, the pilot announced we were leaving Soviet airspace. A mighty cheer went up from the passengers, and two businessmen, fuelled by alcohol, started a game of cricket in the central aisle. But despite all the nonsense, none of us would regret our trip to Moscow. Footnote 1: the swimming pool. 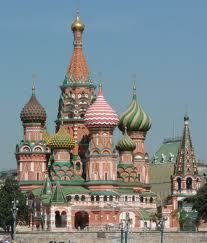 There was in the centre of Moscow an enormous 19th-century cathedral, dedicated to Christ the Redeemer. It was demolished under Stalin, with the intention of building a grandiose Palace of the Soviets in its place, but in the end the site became a swimming pool. After the collapse of communism, the swimming pool went and the cathedral was rebuilt. A sign of changing priorities? Footnote 2: a joke from late in the Soviet era. Ivan Ivanovich hears a rumour that a local shop has sausage for sale,and decides to go and buy some. "Don't be silly!" his wife tells him, "Even if they had any, they'll be out of it before you can get there!" Nevertheless Ivan goes. There is a very long queue already formed at the shop, and long before Ivan can reach the front a man comes out and announces that the sausage has all been sold. Ivan is furious. "It's a disgrace!" he shouts, "I've worked all my life for this country, and now I can't get any sausage! Our government's useless!" A large man comes up to him and says, "Comrade, calm down! Think of what would have happened in the old days if you'd spoken like that!" (he points a finger at Ivan's head and says "Bang!") "So calm down and go home!" When Ivan gets home his wife asks, "Well, was I right? Are they out of sausage?" "It's worse than that", Ivan tells her, "They're even out of bullets!" A note on John Steinbeck's "Grapes of Wrath"